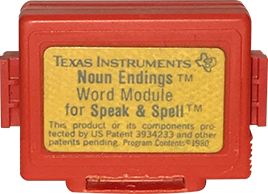 A sample expansion module for the Speak & Spell that extended the toy’s built-in vocabulary. Before helping E.T. the Extra-Terrestrial find his way home in 1982, the Speak & Spell from Texas Instruments (TI) made a splashy debut at the Summer Consumer Electronics Show in Chicago in June 1978. Roughly the size of letter paper, the toy came equipped with a large carrying handle, small video display, speaker, alphabetic keyboard, and now recognizable red-and-yellow colour scheme. On command, Speak & Spell would retrieve a word from memory and speak it electronically. Children would then attempt to spell the word using the unit’s keypad. Speak & Spell would alternate between verbal praise if the word was spelled correctly, or encouragement if the word was spelled incorrectly. Students could progress through four levels of difficulty, with about 50 words in each level. The solid-state electronics inside the plastic case contained no moving parts – a stark contrast from the typical pull-string phonographs and tape recorders typically embedded in other speech-based toys of the day. Speak & Spell’s tech was powered by four “C” batteries or an optional DC power adapter. 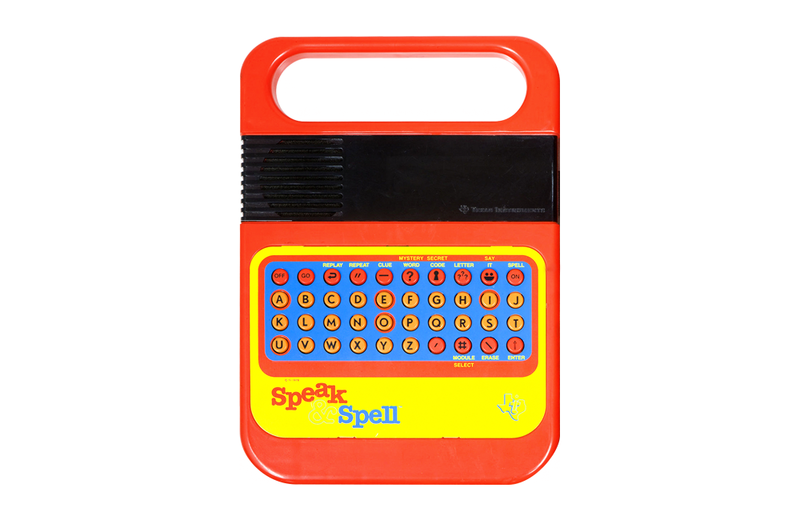 The success of Speak & Spell allowed TI to release a series of expansion modules. These cartridges plugged into a slot and provided added vocabulary and word-based gameplay. TI also ventured into the other two Rs – reading and ‘rithmetic – with the release of variants Speak & Read and Speak & Math. Localized versions of the toy were also produced in a variety of languages other than English.